In the 1990s, during the Clinton Administration, the USA saw many attempts to achieve vertical integration in healthcare. Here we are again! New acronyms were initiated and made popular to describe Independent Practice Associations (IPAs), Physician Hospital Organizations (PHOs), which were managed and administered by entities known as Management Services Organizations (MSOs). Physicians felt the need to group up into integrated entities. These came in two varieties: Independent Practice Associations (IPAs), where each physician or small group (and some large groups, often in a single specialty) retained their business independence, Tax ID, but joined together, primarily for the purpose of contracting with insurance plans (mostly PPOs), health plans (mostly HMOs) and self-funded employers and trade unions, healthcare purchasing coalitions, and other third-party payers (there are actually about 21 different types of third-party payers commonly encountered in the USA). I developed many of these and in 1995-1996, I authored my second "how to" book, published by the HFMA and McGraw Hill Healthcare Education Group, drawing upon examples of business models and case studies from hundreds of IPAs, PHOs, and MSOs that I created or consulted to on operations and infrastructure, or led as an Executive Director or pro tem executive until they found a full time executive. Other physicians chose a different pathway, and sold their practice for a combination of stock and some cash to investor groups that created Private Practice Management Companies (PPMCs). These entities were often created by investors who purchased the assets of the practice and hired the physician(s) as employees or otherwise contracted with them as independent contractors or at arm's length as a group of physicians. In the latter example, physicians in the affiliating group practice sign employment agreements with a professional corporation (PC) created for that purpose. Non-physician personnel become employees of the PPMC's local subsidiary acting as a professional employment organization (PEO). The employment contract with the PC typically includes restrictive covenants that made it difficult for the physician to terminate the agreement because the PPMCs didn't want to be left holding the employee expense liability for the staff and the bricks and mortar without doctors to produce revenues. This was the workaround for states where the corporate practice of medicine prohibited direct employment of physicians by non-physician entities. The amount paid for the practices purchased by the PPMCs varied based on the the brand establishment (usually nondescript; a commodity seller accepting whatever contracts came along), local market conditions and other factors. The most common method of valuation for smaller practices and groups was to multiply the PPMC management fee by a factor of five or six. For example, if a group practice generated annual gross revenues of $2 million and operated at 50 percent overhead, and the PPMC's fee was 15 percent of the $1 million profit (also referred to as the pre-compensation margin or pre-distribution pool of funds), or $150,000. Using a factor of five, the PPMC would then offer around $750,000 to buy the practice. Typically, the practice purchase price included the tangible and intangible non-real-estate assets. The intangible component, usually referred to as good will, was the difference between the purchase price and the tangible assets. It was often calculated "by the active chart" at around $6 per active patient (seen in the past 2 years or so). Physicians who sold to a PPMC, were taxed on the sale proceeds as a capital gain at a lower rate. So by capitalizing part of their compensation from the practice, the attraction was that they paid less in taxes on the same amount of money. While the model made lots of logical sense, the promise of equity affiliation with a PPMC was that the infusion of know-how and capital would lower practice costs and increase practice revenues. To make up for its percentage of the practice profits, the PPMC had to generate practice growth, which create a new term rarely heard of prior to the PPMC phenomenon called “same-store growth.” Until practice growth raised profits enough to cover the PPMC's management fee, every dollar that was allocated to pay for the PPMC's management fee came out of physician compensation — and out of new-physician compensation. This created an unintended consequence that newly affiliated practices had difficulty recruiting new physicians. Many of the PPMC acquisitions were of practices owned by age 50+ physicians. Without new doctors to replenish retiring physicians the difficulty contributed to the crash and burn of the model. The other critical flaw was the same-store-growth expectation. It required a high degree of collaboration between the practice, the PPMC and the physicians and the investors learned a tough lesson: you cannot control physicians like other employees. A key reason for the corporate practice of medicine prohibitions was that the regulators were concerned that physicians as "employees" under the control of Wall Street investors would cause physicians to change practice patterns, decision-making, and have a negative effect on the practice of medicine. Wall Street thought it knew better and could force control over physicians. They lost that bet - and they lost badly. As did the physicians who bet with them. The same store growth was also an issue because most of the acquired practices were not branded, had nothing to differentiate them, and were essentially commodities that could easily be absorbed into the PPMC's brand. The practices (and their physician owners) were varied shades of beige. Many PPMCs founded by investors were intended to be taken public by taking cash out of the transaction and leaving the physicians with an organization that did not succeed. Several PPMCs filed for protection under the U.S. bankruptcy laws before they were able to go public. In the news last week, Moody's Investor Service published a new report that caught my attention because of three new consulting assignments I've been awarded that are centered on healthcare provider integration. Few consultants with the history and lessons learned from the 1990s remain. Most have retired. I started young and am still active. Furthermore, of the few who are still in the business, it is rare that you find any with more than one internationally-published, peer-reviewed books that describe how these groups work, what to watch out for and how to grow, operate and thrive. So what Moody's reported was that, "US not-for-profit hospitals will face greater competition, risk of volume declines and margin erosion as the nation's largest commercial health insurers aggressively pursue growth strategies. As insurers pursue vertical integration strategies, such as acquiring physician groups and non-acute care services, they enter into direct competition with hospitals and hospital services. Hmm. Sounds very similar to PPMC 2.0, to me. Just sayin'. Insurers are from Wall Street too ... they believe that if they can achieve vertical integration, they will be able to provide preventive, outpatient and post-acute care to subscribers and plan participants at lower costs compared to hospitals. The idea is that going forward as the insurer purchases and controls (there's that word again!) more non-acute healthcare providers — particularly physician groups — the insurers will eventually eliminate hospitals or high-cost certain services from provider contracts. This would ultimately translate into lower volume and revenue for hospitals and the physicians the hospitals employ and the medical practices the hospitals have purchased. The two to watch in the short term are the Aetna-CVS deal, and the United Health Group's Optum-Davita deal. Optum is on a pathway to buy more physician group practices and has dabbled in accountable care organization management and ownership throughout the nation. When you have a combination of cash, an inside track into payer contracts, and smart people at the helm, you can do a lot... as long as the doctors are willing to capitulate and be controlled-and as long as the marketplace continues on a predicted trajectory. Change either of those two elements and the predictions about profit, savings, and trajectory go sideways... fast! Hospitals are expected to continue their own merger and acquisition efforts at consolidation, and building vertically integrated "products" for the insurer and self-funded employer marketplace, that offer performance-based contracts, shared savings contracts, episode of care pricing, and bundled case rates. I am one of very few in the USA who have mastered and published successful formulas to bundle case prices since 1997. But unless the hospitals do something about contracting directly with employers and labor unions who make up 70% of the non-Medicare, Non-Medicaid health plans that cover people from 0-64 and disintermediate from HMOs and PPOs, they may find themselves between a rock and an extremely hard place in contract negotiations. I worry for hundreds of my hospital clients in the USA who look to me for advice and strategies to cope with insurers who are aggressively flexing their negotiating power with offers of lower rate increases or cuts in reimbursement. These approaches by health plans and PPOs will likely result in an increasing number of standoffs and terminations of contracts between insurers and hospitals. The patients (plan subscribers) will react badly, and either the plan or the hospital will be blamed for the blow up. Those hospital executives who manage the public relations aspect of this PR dilemma to their advantage will be successful at maintaining peace in the community. But to do this, they will need to develop a backup strategy that maintains access to patients and for patients to have access to the services of the local community hospital. If they payer won't budge, then direct contracting is the only other option, assuming the hospital isn't going to launch their own brand of health plan. That doesn't happen overnight. Ask my clients at Gundersen Health System in La Crosse, Wisconsin how long it takes and how complicated this is, and how much cash is required to successfully deploy. If you don't want to ask Gundersen, there are a few others I can offer as examples of hard work, dedication, forethought, and visionary execution. Many of these CAHs operate on revenues of USD $15 million or slightly higher. Every penny counts and their costs for many consumables are higher than larger hospitals and health systems because they don't buy supplies in bulk like the big box facilities. To explain, let me put on my surgical nurse hat for a moment. A cost of a knee surgery in a CAH can be higher because things like suture, tapes, sponges, and other items are purchased in smaller quantities. As such, they don't get the same discounts that big hospitals get. Even with group purchasing organization (GPO) memberships, the big guys simply get better deals on almost everything. If they don't start to do more than continue their mergers and physician practice and outpatient acquisitions and consolidations, by the time they call me (or someone else who may be able to help) to say "Okay, we're ready to talk about a different approach", I fear for many, it may be too little, too late. The Achilles' heel of the health plans with licenses and Certificates of Authority to do business throughout the different counties in each state are the state's network adequacy regulations. If the insurers and HMOs cut too many hospitals and physician groups and cannot meet network adequacy minimums, they cannot operate or sell policies in the county. 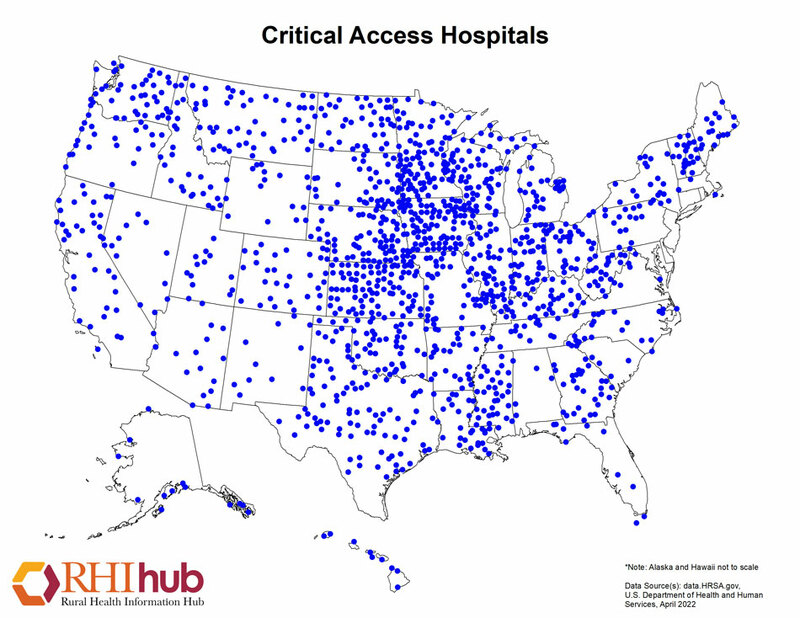 But that leads to another argument entirely: are we over-bedded in terms of U.S. hospitals? Is length of stay still medically unnecessary at current levels? The decision as to who wins that argument about if we are or if we aren't is a matter of the outcomes of two things: technology acquisition, implementation, utilization and what can be supplanted by what the health plans roll out in competition with the hospitals and branded health systems and what happens in the deployment of telehealth and telemedicine. If the CAH's don't have access to capital or revenue from third-party payer contracts (remember there are about 21 different types of payer organizations out there) innovation, creativity, and adaptability become difficult to continue to the point that the CAH's falter and could close, leaving the local community with healthcare access problems which deteriorates social determinants of health, access to care, and causes doctors to relocate to urban areas where they can make enough money to live and pay off student loans for their medical education. At that point, the health plans may offer the only option with whatever they build, assuming they build their new branded outposts in a mix of urban and rural areas. If they concentrate everything on the urban centers, the rural denizens will have telehealth and telemedicine as a fallback, assuming they have access to strong enough cell phone signal, Internet and know-how to use the telehealth and telemedicine services. Otherwise, we'll see a rise in domestic medical tourism growth. Why domestic? Because these places are many hours' drive from international airports, most don't have passports, and the majority of these rural dwellers have no interest in (or financial resources available for) crossing international borders to access healthcare. As you take all this in, you can suddenly understand how my unique mixture of domain areas of expertise, medical tourism, telehealth, managed care contracting, physician employment contracting, physician integration and alignment, are all interconnected. But more importantly, you can see that if you are a hospital considering continued physician practice acquisition for the sake of controlling admissions and referrals for diagnostic technology services, you had better start examining other alternative realities. Hospitals should revisit how you intend to maintain access to patients if the insurance plans offer you untenable contracts or worse, abruptly shut the door in your face and take their members to their own facilities and medical groups. Physician must examine their options carefully. There are more options than being acquired by a hospital or selling to a PPMC owned by a health plan. If the Affordable Care Act disappears, ACOs in their purest sense will also disappear, because their existence is tied to the Affordable Care Act. Other physician integration entities that do not explicitly contract with Medicare are called ACOs but the true definition of the ACO is embedded in the Affordable Care Act ("ObamaCare"). The ACO was one of the main ways the Affordable Care Act sought to reduce health care costs by encouraging doctors, hospitals and other health care providers to form networks that could coordinate patient care and become eligible for bonuses from Medicare and Medicaid when they delivered that care more efficiently. We've seen proof that while this was touted as the way forward, the whole ACA/ACO deployment and execution has not gone as well as planned. IPAs, and PHOs and new entities (Clinically Integrated Networks (CINs) and economically integrated networks of physicians are already starting to surface in both specialties and primary care. You'll have to decide what's right for you, how much clinical autonomy you are willing to concede, and how much you want to learn about business management in healthcare vs the clinical training you hoped you could focus on and put to use after residency and fellowship. To the insurers, I have one admonition: Don't shoot yourself in the foot! You don't have to own something to control it. And you may not control it if you cannot control the power of the guys and gals with a pen and a license to practice medicine. There aren't enough doctors willing to sell you their tangible assets...and their souls.